After it had been shown by A.G. Lyon in 1964 that small sporangia in the Rhynie chert often seen together with Asteroxylon do not belong to the latter but to another plant which he named Nothia , this plant was thoroughly investigated by means of peel sections, with the results published in 1979 . The sections of sporangia shown there (Figs.4,5 in ) do not show as much detail as the present ones, possibly because of the small size in print. Therefore, a larger picture of a Nothia sporangium with more detail is presented here. 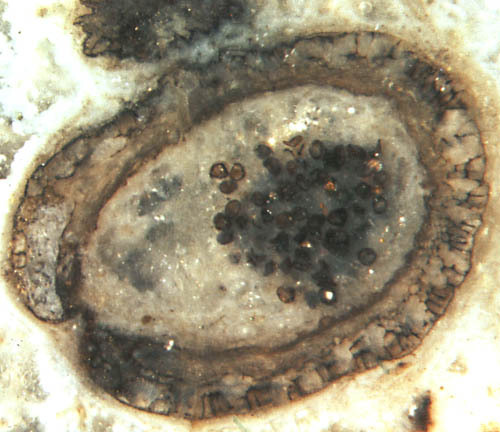 Image: Nothia sporangium in Rhynie chert. Note the cross-sections of big tube-like voids in the capsule wall as components of a complex structure involving various cell types. 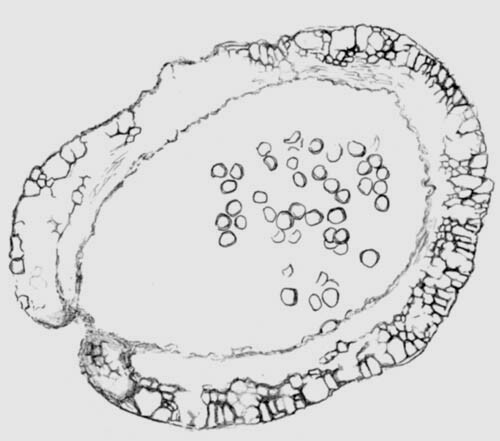 The gap in the sporangium wall is the dehiscence slit seen in cross-section. Width of the picture 1.9mm. It must have taken a series of evolutionary steps to bring forth a wall structure as complex as this one. As a most peculiar feature, a few tube-like "giant cells" are embedded in the epidermis in such a way that only a narrow strip of every one appears on the surface while the bulk is hidden beneath . They are seen here in cross-section. They had tentatively been regarded as cavities analogous to stoma chambers  but alternatively interpreted as big tube-like cells with up to 1.6mm length in the most detailed publication on Nothia : "The most characteristic feature of the epidermis of Nothia aphylla is the presence of the enigmatic giant cells." The present sample provides a surprise: Some of the "giant cells" do not look as empty as they are supposed to be. Cell walls extending from the edges of neighbouring cells are faintly seen inside. Hence, the alleged giant cells seem to have formed from bundles of narrower cells with thin and frail walls between them which disappeared at some stage of maturation. If this happened while or after the plasma itself broke down, the resulting larger compartment could not be called a cell. Then what is called giant cells would simply be closed cavities, differing from the type of cavity envisaged in . They could have served as water storage vessels  or as hollow structural elements, possibly filled with air. However, the fact that they are found mainly on the aerial axes and on the sporangia suggests a more sophisticated interpretation: They may have served as tubes filled with poisonous or irritating liquid, a deterrent also applied by a large variety of extant plants. Some of the milk-producing plants make their tubes by removing the walls between adjacent cells. Possibly Nothia was able to do the same. The advantage of tubes for such purpose is obvious: If tapped by a spore eater, a tube under pressure would spill its content profusely and soil the biting creature with sticky liquid with possibly fatal effect.